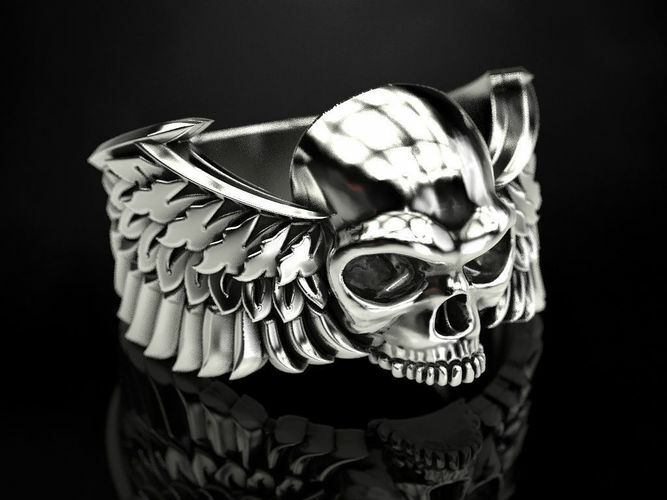 This is a skull ring with a wings motif, an ideal ring for a biker. The winged skull is a motif that has its origins in the 14th century, when the black death ravaged across Europe. The Cult of Death arose around this time and this motif became one of the its images, and this design lingered on. Ring sizes inner diameter – 18 mm (+ USA size: 5|6|7|8|9|10|11) Recommended material - silver or gold! Approximate metal weight (for ring size 18 mm): gold 14k – 10.7 grams; gold 18k – 12.8 grams; silver 925 Sterling – 8.6 grams. Model volume (for ring size 18 mm): 826.881 cubic mm. Model avalible in STL format for prototyping. Geometry is healed, and fixed all the bad with RP Magics software You can check out my other products by clicking on the author name artchagur. Any questions? Please contact me. Thank you!